Exercise is a natural, pill-free antidepressant! Heading out for a run may seem like the last thing you want to do when you’re feeling down, but getting out and going for it will actually help you battle against the blues! That’s due to science, baby. Exercise stimulates the release of endorphins, the “feel-good” hormones, which act as natural opiates in our bodies. The delivery of these “happy hormones” is what many antidepressants try to mimic to relieve depression. Here’s how it works: after you’ve been exercising at a low to moderate exercise intensity for 15 minutes, endorphins kick in. When these runner’s high hormones peak in your bloodstream, they block pain receptors in the brain and increase those feel-good sensations. It only takes 15 minutes! So if you’re short on time, even quick bursts of activity, like HIIT workouts will be an effective mood booster. Besides the endorphins, there are plenty of other ways in which physical movement can spark feelings of happiness! Hate running but love to dance? Take a Zumba class, take up salsa, or just dance around the kitchen with your family after dinner. When exercise is enjoyable, it lifts your mood and makes it easier to stick to. That’s fun for everyone! Physical activity is a natural way to de-stress, which adds to the “high” that comes along with it. Moving your body gives it a chance to actually “practice” dealing with physiological stress, so you’re better able to handle whatever life throws at you in later on. It’s true – the physical stress your body feels during that vigorous morning run can help you better manage the emotional stress you may feel later at work. We’re often quick to assume that a sweat-sesh will leave us feeling sapped of energy and lead to fatigue. However, it’s just the opposite! Regular, even low-intensity exercise, has the ability to increase our energy levels by a long shot! Researchers believe that moving our bodies has a direct action on our central nervous system to reduce lethargy and pump up energy. Next time you reach for an energy drink or extra cup of java, consider adding in a bit of exercise to ward off those mid-afternoon yawns – go for a quick 15-minute walk and take the stairs on your way back to your desk. Calling all couch potatoes: getting regular exercise of moderate-intensity is associated with a lower chance of getting sick when compared to those who say “no thanks” to physical activity. 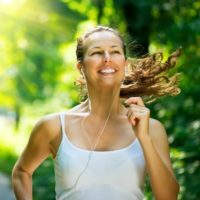 A modest amount of movement boosts your immunity by increasing the amount of interleukin-2, a signaling protein that helps your immune system communicate better and fend off impending sickness. This strengthens our bodies and allows us to more effectively fight illness, plus it reduces the levels of stress hormones needed to do it! For the best cold and flu fighting results, try to fit in at least 20-30 minutes of moderate activity 5 days per week. But don’t go overboard! Remember that more isn’t always better; too much exercise can actually harm your body instead of helping it. Strike a balance for optimum performance! Bottom line: For a happy and healthy body and mind, get moving! Subscribe to my newsletter and join us on Melissa’s Healthy Living Facebook, Instagram, Pinterest and Twitter for daily feel-better inspiration. https://jap.physiology.org/content/103/2/693 à Gleeson J. Immune function in sport and exercise. J Appl Physiol. 2007;103(2):693-699. doi: 10.1152/japplphysiol.00008.2007. « Tiger Nut Flour Waffles, Pancakes & Muffin Bake-Fest!